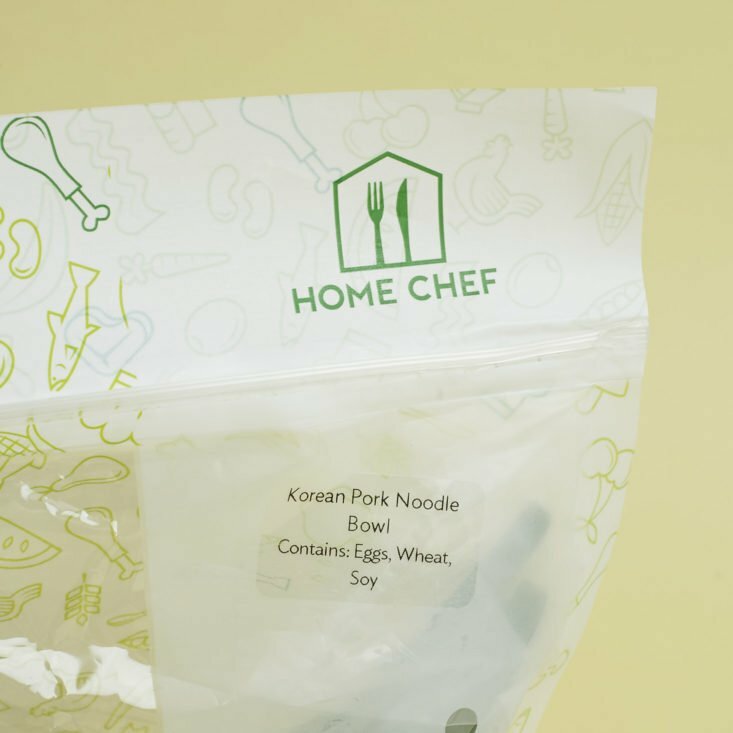 Home Chef is a meal kit subscription that delivers you a weekly box of the pre-portioned ingredients you need to make two to six meals that feed two, four, or six people. Home Chef advertises easy recipes that can be made in about 30 minutes. They say their ingredients are fresh (though they don’t provide a lot of information about their sourcing practices), and they offer vegetarian, gluten-free, and calorie/carb-conscious recipes. This is a review of the plan I customized that includes a mix of beef, fish, poultry, and vegetarian options (starting at $9.95 per serving) for two people, two meals a week ($39.80) + a no-cook lunch ($7.99 per serving) to equal $55.78 total per week. Delivery is free for orders over $45. Shipping is $10 for orders less than $45. The Cost: Meals start at $9.95 per serving, and delivery is free for orders over $40. 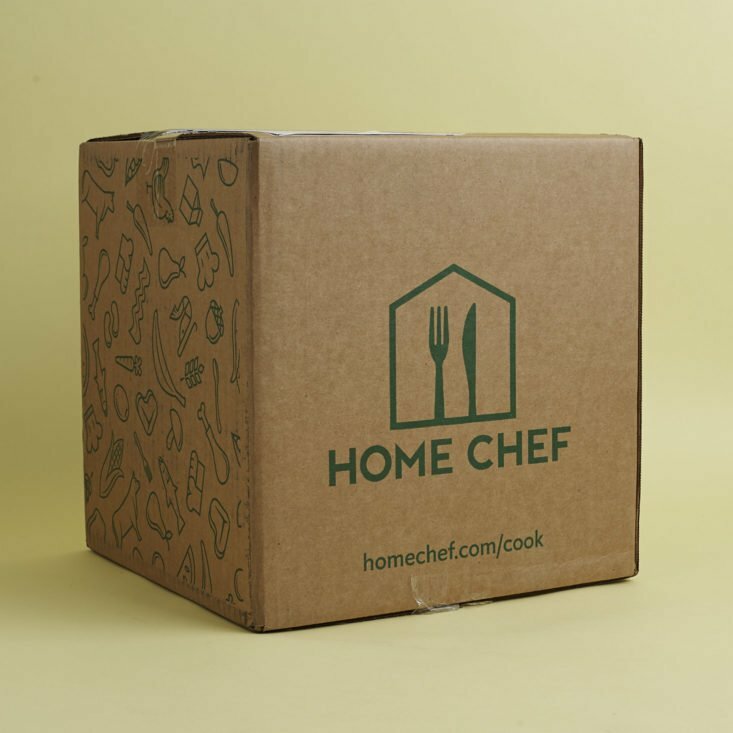 COUPON: Get $30 off your first box from Home Chef. No coupon required, just use this link. The Products: Fresh ingredients and chef-designed recipes— everything you need to make restaurant-quality meals at home. When you first sign up for Home Chef, you take a short quiz about your meal preferences and dietary restrictions. I like that they ask what you like to eat, as well a what you like to avoid. Based on your answers, Home Chef will choose recipes for you to get each week. As is the case with most meal kit services, you can log in and hand-select the recipes you’d like to receive. Note though, that the more particular you are with your diet, the fewer options you’ll have. I’m pretty open to most proteins, so I currently have 10 different options for next week. There are also some “Add On” items like fruit, smoothies, or quick lunches that you can choose to include in your box. On one box flap, you’ll find their social media handle, @realhomechef. The other flap gives a short rundown on how to properly dispose of the various packaging. After opening the box you’ll see instructions on how to recycle the packing material right on it. You can throw the cotton fiber “stuffing” in the trash (or compost, if you are so inclined) and recycle the plastic. You’ll then find all of your ingredients tucked inside. The vegetables and non-meat items will be on top. Under them, you’ll see a cardboard divider that lets you know there is more below. This is where the ice packs are: with the meat to keep those extra cold. You can choose to toss the packs into your freezer to reuse, or simply cut them open to dump the contents into your normal trash and recycle the plastic. Each Home Chef meal comes in a plastic bag, except for the meat, and some ingredients that are too large (such as ears of corn). The bags are labeled as well to cut down on any confusion when you have multiples in your fridge. I didn’t have any salmon last month in either of my meal kits, so I kept this suggestion as one of my meals this time. Glancing over the recipe, I agree that this is an easy one. I started with the salmon (seasoned with salt and pepper) skin-side up in a pan with olive oil for 3 minutes. Once browned, I flipped them over for an additional minute. After that, they went onto a baking sheet (skin side down) and into the preheated 450-degree oven for 7 minutes. …and blended. That will be set aside to be used while plating. The salmon came out and was set aside. Next, I took the zucchini I had sliced (using my new mandoline slicer!!) and plopped into the same pan from before with olive oil for 5 minutes. Once they were softened, I added the diced tomatoes, white portions of green onion, and cooked until tender (3 minutes). After that, I added salt and chopped thyme to season. Everything went on to the plate and the salmon (still warm) was topped with hot honey butter, while the veggies were garnished with chopped green onion. The salmon was AWESOME and I was surprised at how much I liked the hot honey butter, but the side here fell flat for me. I think tomatoes were a strange pairing with zucchini and overall, I don’t like hot tomatoes (unless they are a sauce). I was super excited to see this pop up as a choice for my Home Chef week. I adore Korean food and I don’t eat pork much, so I thought it’d be a good variety. The instructions made it seem really easy, so I was game to make this for the first time. I started by cooking the lo mein noodles in boiling water, then draining and adding toasted sesame oil. I just love the smell and flavor of sesame oil! Here are the fully cooked noodles after they’ve been drained. I thought it seemed a little sparse and I personally could have used more. While the noodles were cooking, I made the sauce which consisted of 1/2 water, teriyaki glaze, and half of the included gochujang red pepper paste. I then got the ground pork crumbled into the pan with olive oil to brown as well as trimmed green beans, white portions of the green onions, and some salt as well. They were in there about 9 minutes. I removed the pork and beans (hehe) from the pan and put the cooked noodles in so they could crisp up on one side (3 minutes). Then everyone came back to the party, and I added the teriyaki-gochujang sauce to it (plus some salt, to taste). Voila! My beautiful Korean Pork Noodle Bowl. I am really happy with how this came out. It looks so colorful after garnishing with green onion, cilantro, and Fresno chile slices! This is probably one of my favorite meals in recent memory. The ground pork was really tasty with the sauce, noodles, and cooked yet firm green beans. I devoured this quickly and was really satisfied (I think I took more of my fair share of the noodles). It was spicy without being too much. Super great, would make again! I got two huge hearts of romaine (one for each serving), plus a bag of ready-to-eat cooked and cubed chicken, cherry tomatoes, shredded white cheddar, two packets of Marzetti (honestly my fave brand) ranch packets, and Cajun seasoning to make the salad. At first, I was confused by the lack of a recipe card (meal kits have me so trained) until I realized that this was so simple that I didn’t need one. I ended up dumping the cajun seasoning into the bag of chicken and shaking it around to coat. I then chopped up the romaine, rinsed the tomatoes and that was about it! Here is the assembled salad. It took about 5 minutes and I didn’t need to cook a thing! This was quite a large portion and even though I finished it, I felt quite full. This was a quick and easy lunch which made me feel really good since I almost NEVER pack a lunch and end up spending money on something that’s just easy and probably not as healthy. Verdict: Home Chef crushed it this month! Even though the side to my hot honey salmon was a miss, I liked everything else so much that it made up for it. I am totally planning on making that Korean Pork Noodle Bowl on my own sometime, and am very pleased with my first quick lunch addition! I highly recommend adding items on if you are currently paying shipping costs. Even though overall you’ll pay a few dollars more, you’ll get two servings of something for super cheap! Can you still get this box if you sign up today? Since Home Chef menus change weekly and you must choose them ahead of time, you won’t be able to order these dishes unless they are offered again in the future. 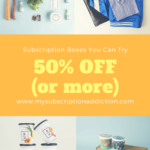 Coupon – Get $30 off your first box from Home Chef. No coupon required, just use this link. Value Breakdown: At $55.78 for this box, each dinner was $9.95 per serving and the lunch was $7.99 per serving with free shipping. 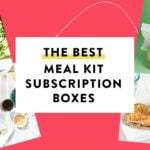 Check out all of our Home Chef reviews and find other meal kit boxes in the Food Subscription Box Directory! What did you make from Home Chef this month? How do subscribers rate Home Chef? Do you subscribe to Home Chef? Add your rating now! Your Home Chef order for delivery on Wednesday, January 24 does not meet our required minimum and will not ship unless you update it. I assumed I would not have to do anything and would not receive a delivery. I was charged $50 and received two meals! Cancelling immediately. I like to grill vegetable in the oven with olive oil and season salt. I always add tomatoes. The heat makes them sweet. That Korean noodle bowl was FANTASTIC. I couldn’t believe how good it was. I agree about the noodles though, I left in my review they needed to double the noodles and half the pork. Also, glad you jumped for the add on, it’s really a no brainer! It was smart to shake up the seasoning in the chicken, I just sprinkled mine on top and didn’t really taste it but it was still a great lunch for Monday and Tuesday! I friggen love HC, I highly recommend it to amyone considering a meal delivery service. I had tried them to 2 weeks and the meals were pretty good. But I called to cancel as soon as I was charged the third time to save some money and they said they would cancel my account and refund me the charge. I noticed no refund. I called a second time and they said I should receive the refund soon but never did. Filed a claim through my bank and called them a third time and they said they had never cancelled my account and never refunded me! I was very unhappy. It was annoying spending so much time just trying to cancel and get my money back.